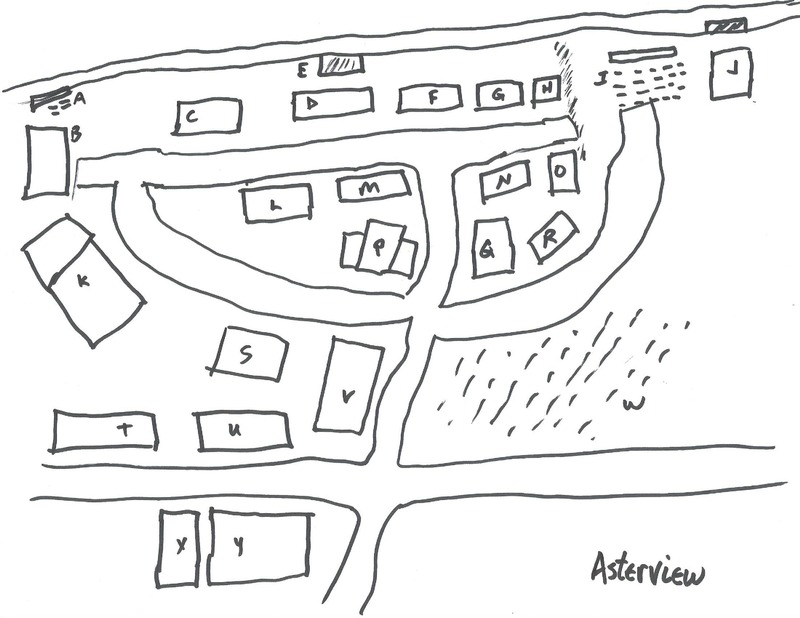 Now that we have a layout for Asterview, we need a few notes on the setting for the village. Your campaign may have different geography to drop Asterview into, but I’ll assume that the river flows West to East and the asters are north of the village. The locals call the river the Winding River, although it has various other names upriver and downriver. North of the river the land slopes uphill, and to the northwest there is a small mountain range. Multiple brooks and streams from the mountainous area feed into a small pond about five miles upriver, and the pond itself empties into the Winding River. About ten miles downstream the river leads into a large lake which is drained by a large river that heads southeast. Fishing is fair from the docks, but better upriver or downriver from the village. Both the pond and the lake are good spots for fishing, but the further people travel from the village the more dangerous it becomes. As the party approaches the village there is a large, well-traveled crossroad heading east and west. There is an area northeast of the intersection that serves as a farmers market most of the year and as the setting for a large fair four or five times a year. There are a number of permanent small booths and roped-off areas that are leased out to traveling merchants. Visitors may not pitch tents or sleep outside near the farms or within about a mile of the village, but there is a tavern that doubles as an inn with rooms that cost about 1 to 3 gold per day (plus an extra 5 silver for each additional person). Staying outside town will leave adventurers subject to all sorts of potential encounters. Adventurers who are willing to sleep in barns at near-by farms will be able to work a few hours or pay 3 silver pieces per night for a place in the barn and two meals. Details about the residents will be added as we meet them. A party of six unknown characters will immediately attract attention as they approach the village, and one of the sheriff’s deputies will come out to meet the party as they get past the crossroads. We’ll deal with that encounter tomorrow! While we debate the need for fishing in a D&D adventure (just think of the time it can kill!) here’s Brad Paisley to sing about his experience fishing. We had a Yu-Gi-Oh Day special event today, and with the crowd and noise about all I could get done was some copy editing on past columns. The main thing I did was fix the links so that when you clicked on one it opened in a new tab automatically so that the blog stays open. HTML lesson: how to put a link into your blog. The strange target=”x” tells the web browser to open the new webpage in an area named x, but since you probably didn’t create an x location the web browser shrugs and opens the page in a new tab. Facebook is once again showing the alternate news that California is looking to leave the US (guess why!) Back in the 70s Danny Holien wrote a song begging Colorado not to follow California…while it may have been under different circumstances, and concern losing the wilderness more than anything else, leaving with California now wouldn’t work too well unless a few other states left with it. Time and patience is probably a better plan than leaving, and in the meantime the video does have a lot of nice scenery! Less than a week ago it was 60 degrees here in Anderson, but at the moment I can look out the window and see snowflakes falling (and watch cars sliding around in the parking lot). It really shouldn’t be that much of a surprise since it’s still January, but the swings in temperature certainly seem wider than they used to be. Fortunately the weather didn’t dissuade customers from showing up to plan Magic in Friday Night Magic tonight – for the first time in a month we have enough players for both a Standard event and a Commander casual event. Maybe with the release of Aether Revolt and the banning of a few cards more players will return for Standard. In the meantime we’ll keep trying to run Frontier on Sunday afternoons, but so far we seem to get only four players each week (at least it’s mostly a different four each week). Frontier is yet another attempt by players to use their old cards instead of constantly buying new ones – Frontier doesn’t go back as far as Modern or Extended, only back to Magic 2015. The advantage is players get to use some of their old decks/cards, and if they don’t have a deck that works there aren’t any cards in the format that cost more than about $15 with the exception of a few cards from the last two sets (which should be cheap enough if players are patient about buying them) and the $15 cards are just the special lands. If attendance doesn’t improve we may switch to running a type II league where players start out with a few packs and simply add another pack each week. An interesting and related Kickstarter popped up today (one that I have nothing to do with!) that contains materials from a lot of people I’ve worked with. Since it’s in Kickstarter none of us have any way of knowing when it will ship or how good the material will be, but it’s certainly worth a look. There’s a difference in writing an adventure for your local campaign and writing for a wider audience of unknown players and judges. With your own group you have a good idea of how your players will react to most situations, and that makes it easier to design encounters for them. When writing for a wider audience you have to worry about parties with evil players (or players who think their chaotic neutral characters are evil) and parties that simply kill everything that they encounter and parties that don’t want to fight anything. That’s a lot tougher! I spent most of the day ordering comics for March from Previews, so there wasn’t enough time to finish up the map of Asterview; tune in tomorrow! The party’s trip is uneventful for the next day, and about 3 in the afternoon they reach Asterview. Since this will be the center of their adventuring for at least several levels, we need to have a lot more information on the village itself (and leave some room for expansion later). Today I’ll simply detail the locations we want in the village, and tomorrow I’ll try to create a map. The path the party is following widens into a road and passes between a number of small farms. The farms will include farms that specialize in either agriculture or livestock, although all the farms will have at least a little of both. Before reaching Asterview the road will intersect with a larger road that is perpendicular to it and clearly well-traveled in both directions. There won’t be any additional farms from this point, but the party gets a good view of the village. Asterview has grown up next to a river that is about 8 to 10 feet deep and 15 to 25 feet wide. Across the river the bank rises rapidly towards rolling hills and is covered with the asters that give the village its name. Between the road and the river are about a dozen buildings, most of which have fences and small garden areas. We’ll need to identify the residents in the buildings as well. Everybody knows Lefwynn, who unfortunately is usually either drinking at the bar or nursing a hangover from the day before.